Kate Middleton and Prince William are about to celebrate a big marital milestone later this month: their ‘wooden’ wedding anniversary! 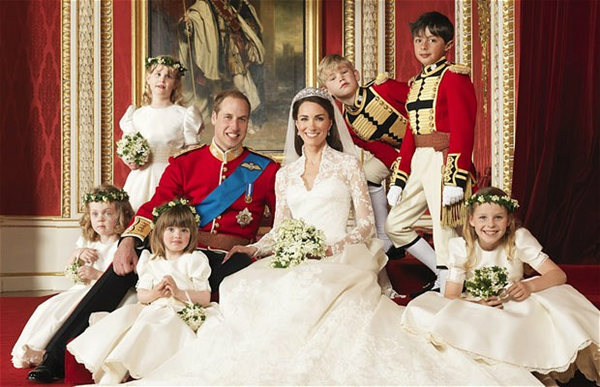 Five years and two children after the glorious event that captivated no less than 2 billion people who tuned it to watch the royal nuptials, the world is still in awe when it comes to the likes of Kate and William wedding. Here are just a few of the best moments of the world-watched event, moments that have that unforgettable, fairytale-like quality. 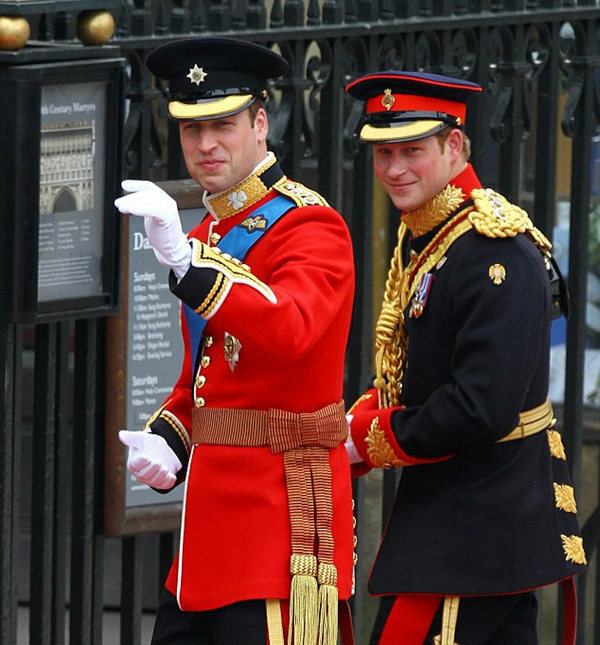 The groom and his brother / best man Prince Harry were the first to arrive at the Westminster Abbey church, looking cheerful ahead of the highly anticipated, fabulous event. 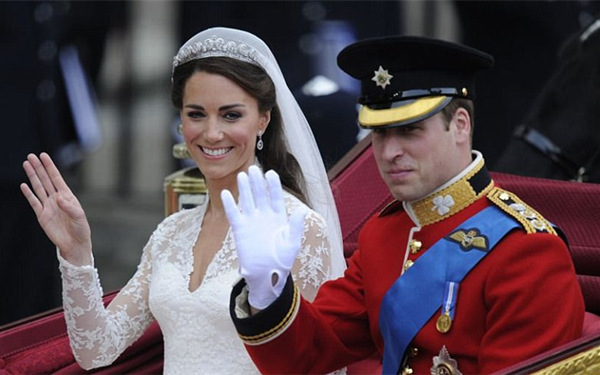 The bride and the Queen were not the only ones whose arrivals were highly anticipated as the whole world prepared to watch the glamorous Kate and William wedding. 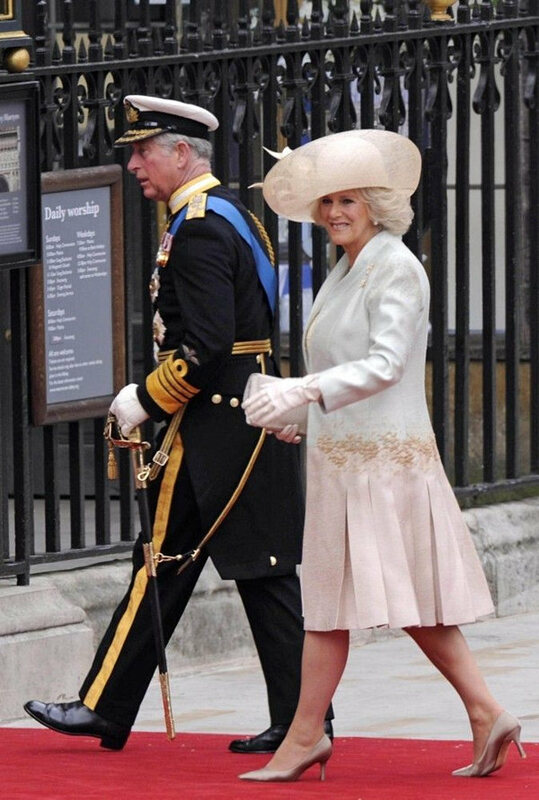 Charles and Camilla arrived at the nuptials dressed to impress, followed by the mother of the bride, Carole, wearing a pale blue coatdress. 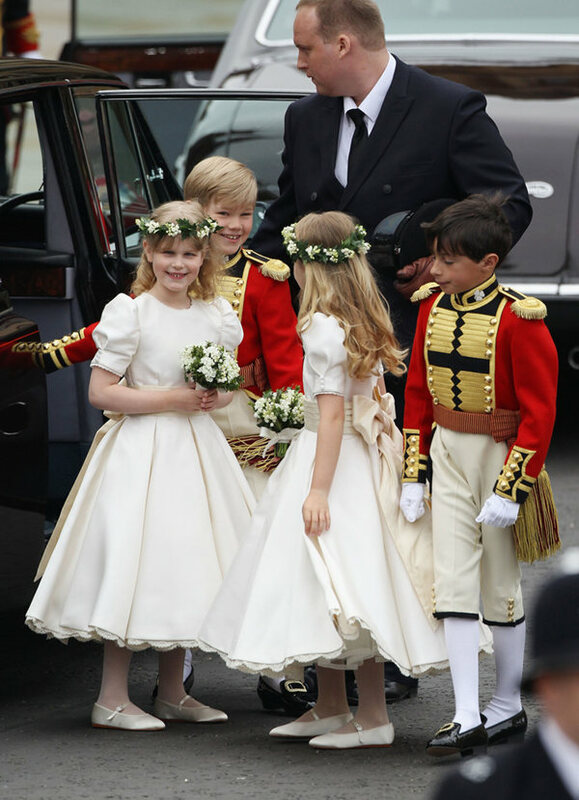 Dressed to the nines and endowed with their biggest smiles, Tom Pettifer, Master William Lowther-Pinkerton, Lady Louise Windsor and Margarita Armstrong-Jones arrived at The Abbey ahead of the nuptials. The Queen’s appearance ahead of the royal wedding was definitely a highlight of the day. 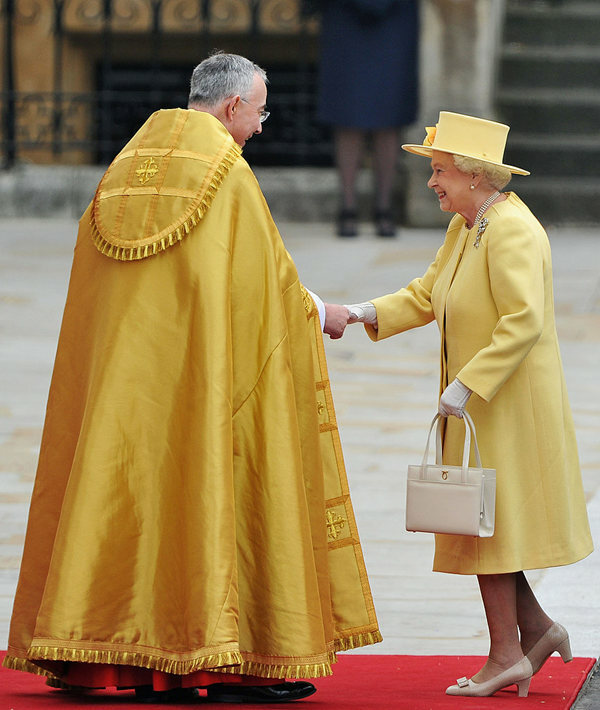 Dressed in one of her trademark colors, sunny yellow, in an Angela Kelly wool crepe dress with a matching coat, the Queen looked proper and joyful at the event. Pippa, the now-famous sister of the bride and the maid of honor of the day, did not go unnoticed in her immaculate white dress that revealed an equally flawless figure, as she held her sister’s long train. 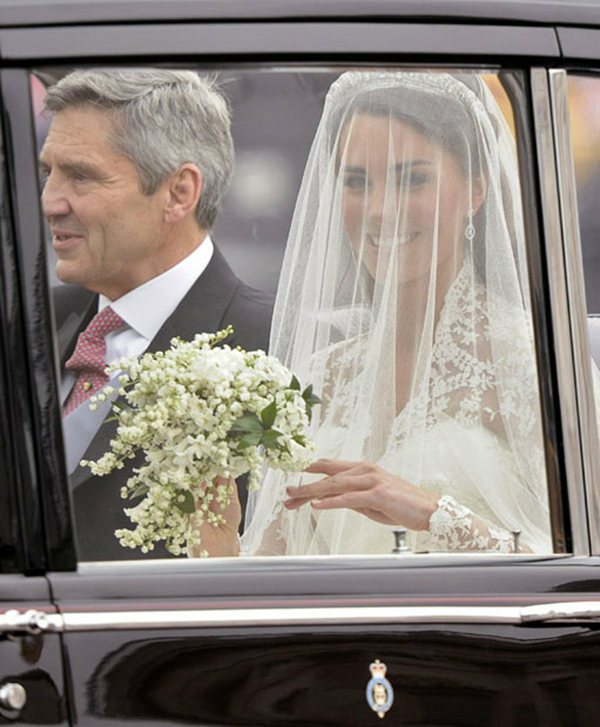 The bride and her proud father Michael Middleton were spotted by the crowd as they arrived at Westminster Abbey in a Rolls Royce Phantom VI, while Kate greeted the people with a subtle hand wave. 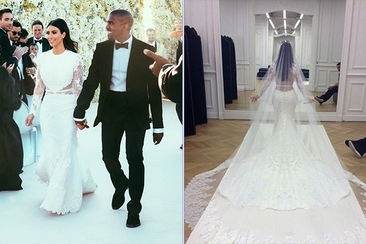 A simple, yet elegant creation featuring long lace sleeves and an impressive train designed by luxury fashion house Alexander McQueen, carefully matched with a silk tulle veil and a Cartier tiara; the bride looked stunning, yet not overly-ornate in her chosen ensemble. 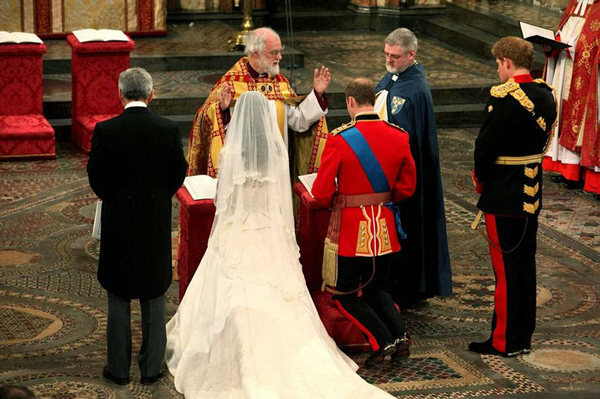 In true traditional fashion, the bride’s father, Michael Middleton, walked the soon-to-be duchess down the altar, where she was welcomed by her groom. Sister Pippa and the adorable crew of wedding party kids followed them closely. 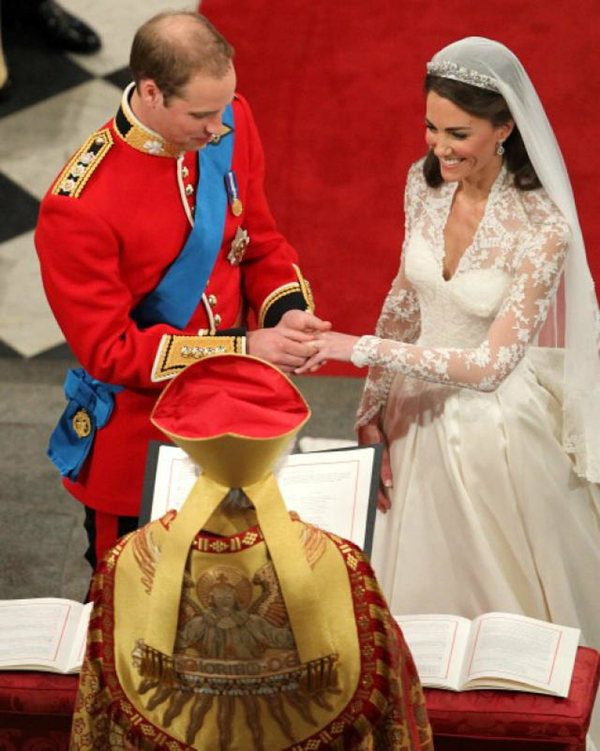 As one of the most romantic moments of Kate and William wedding, William welcomed his blushing bride at the altar, then whispered “You look beautiful” to her, like any other groom mesmerized by his future wife’s glowing beauty. 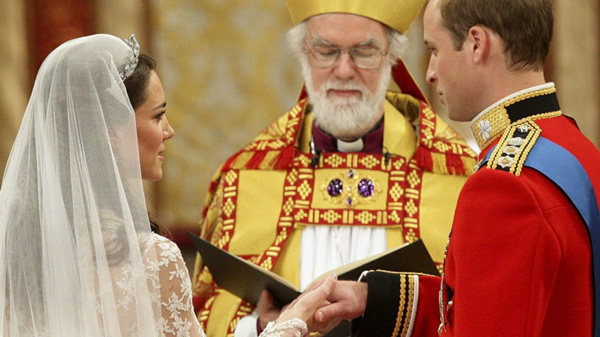 One of the most important moments of the nuptials captured in photographs was the moment during the ceremony when Kate and William kneed down at the church’s altar. The bride and groom looked into each other’s eyes as they vowed eternal love in front of not only their families and friends, but the entire world. 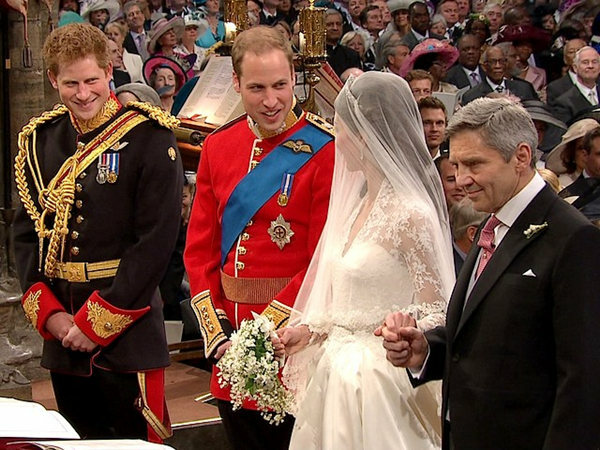 As a pivotal moment in any wedding, the romantic ring exchange between William and his bride was loaded with emotion and shy smiles on both sides. 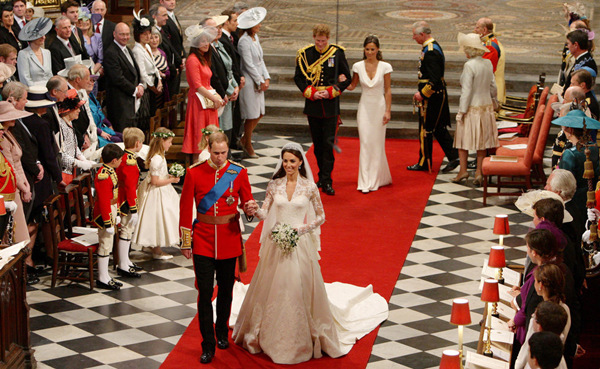 Married lovebirds Kate and William left the Abbey as husband and wife, delighting the crowds. Soon after, the other royals and Kate’s family left the Abbey while engaging in some post-ceremony chatting. One of the crowd’s favorite moments of the royal wedding was definitely the open carriage processional, when the newly married coupled waved to crowds from a 1902 State Landau carriage. 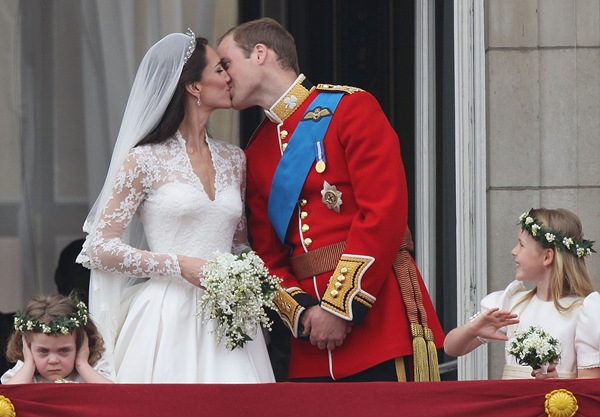 No other moment can compare in romanticism and fairytale dosage when it comes to Kate and William wedding with the balcony kiss, a magical moment that the newlyweds shared with the watching world and the enthusiastic live crowd. 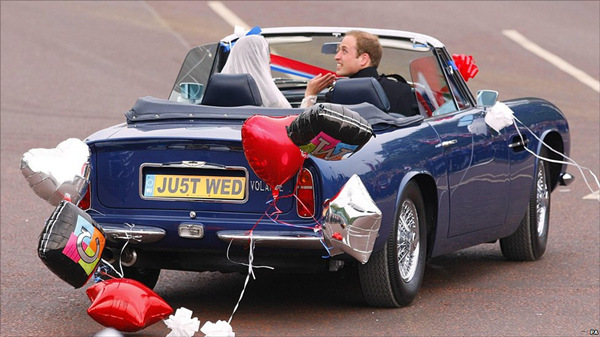 The new bride and groom left to Clarence House in a 1969 Aston Martin DB6 car, which was given to Charles by the Queen as a 21st birthday present. In true celebratory fashion, the car was decorated with blue ribbon, red balloons and pompoms for the big event. 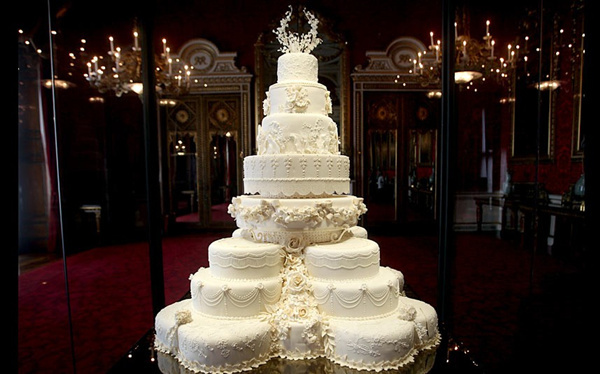 A highlight in any wedding, the royal wedding cake was spectacular in design and, most likely, in taste as well. The cake, a multi-leveled, traditional fruitcake with smooth white icing and ivory roses created by Fiona Cairns delighted the guests at the reception. While she chose white like her sister for the ceremony, Pippa opted for a bright green hue when it came to her second dress destined for dancing and mingling. The beautiful bride chose a stunning second wedding dress for the reception, which featured a sparkly crystal waist and a fitted bodice and opted to pair the strapless number with a cropped cardigan. 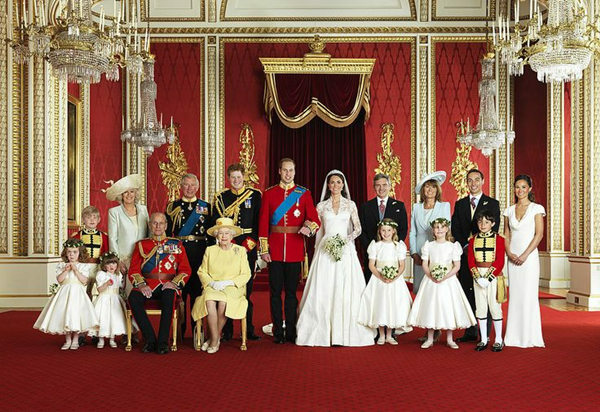 Kate and William wedding could not be complete without a family portrait and there’s no better way to describe this highlight than as a picture-perfect moment. 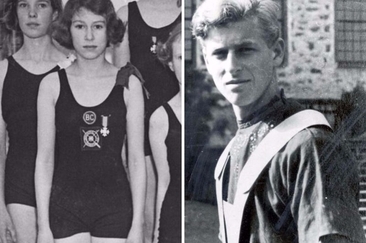 Before there are Will and Kate, there were Queen Elizabeth and Prince Philip – the ultimate royal couple. Read their love story from the very beginning to their current bliss. 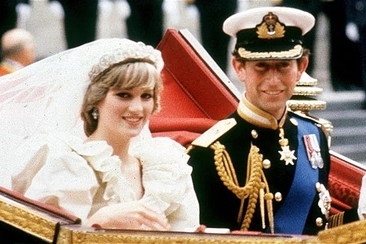 Prince Charles and Princess Diana Wedding is called the wedding of century. 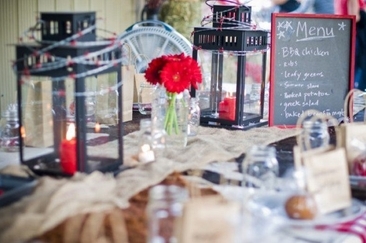 Let’s have a glimpse of her fairytale wedding in detail and explore, what made this wedding so special. 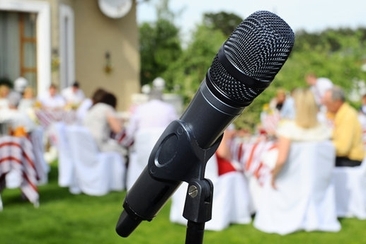 Check out 15 great and unique rehearsal dinner ideas for some great themes for your dinner, like a movie night, a BBQ dinner, or a dinner with card games.